We strive to ensure that your shopping experience with Powersports Discount is (almost) as fun as riding many of the vehicles we sell! Please contact us if you have any issues with your purchase before returning it. - Package must be shipped via traceable, insured service (i.e., UPS Ground). We are not responsible for loss/damage in transit. Refunds are limited to the purchase price of the product, less any discount/coupons applied to the purchase invoice. 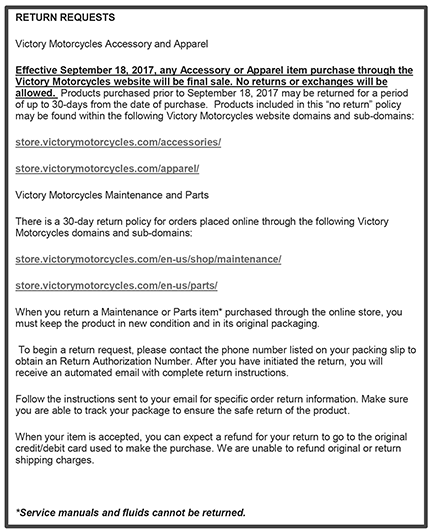 Refunds for shipping and handling charges are only granted if Powersports Discount(Honda East) has inspected the item and verified that it was shipped in error or is defective. Return shipping refund amount is limited to the amount charged for shipping on the original purchase. In the case of combined or promotional shipping on the original purchase, return shipping refund is limited to the current standard UPS Ground rate for the item(s). Requests for exchange are subject to the availability of the item requested. Many of our best deals have limited stock available and similar items varying only in size or color may be sold out by the time your return is received and processed. We will make every effort to fulfill the exchange as you've requested in the "Exchange/Replacement Options" are of the form. If the item you've requested is not available, we will notify you via email and issue a refund via your original payment method. Our inventory changes daily, the best way to ensure that you receive that item is to simply purchase it outright and request a refund for your return. You may contact us to check availability, but we cannot "hold" any product pending receipt of your returned merchandise. Up to 40% Restocking Charge on all returns and special order cancellations. No returns on electrical parts. Thanks for shopping with Powersports Discount and Honda East!